I'm thrilled to be guest-blogging on The Lunch Tray today. I share many of Bettina's passions, embodied by her motto "Kids and Food, In School and Out." 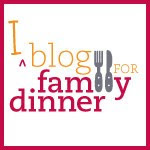 Eatdinner.org is part of my own advocacy efforts for reclaiming family meals, despite our busy schedules, improved access to good food for all, and more support for healthy habits for kids and adults. Summer and the living is easy...it seems that way at our house. Longer days, later schedules, no homework to do in the evenings, just happy stories from the camp day, frozen juice pops on the porch and watching for fireflies (whilst battling mosquitoes!). Of course, parents still have to work, but even work schedules seem a bit shifted. Everyone seems to have conflicting vacation schedules that can make deadlines more flexible and lengthen out the cycles of "must-do" assignments. Skipping out of work a bit earlier (or merely on time!) once or twice a week may be more do-able now that in the hectic autumn days. So why not use this time of relaxed bedtimes and looser schedules to re-think family routines, and in particular, family dinner? During the summer, there tends to be less pressure to get children to bed early in order to be awake for school. My daughter's day camp starts at 9am instead of 8:40am, and even that 20 minutes gives us a little more breathing room in the morning than seems to last all day. Take advantage of this to stop looking at the clock at dinner time. Schedule family dinner time a bit later so that everyone can be there. Summer is also a prefect time for simple dishes or cold food that requires little or no cooking. No one wants to eat fussy food when it's hot outside. I've included a recipe for chicken below that is so easy; it's like not cooking at all. Maybe making a few simple summer meals will take the pressure off thinking of family dinner as a big elaborate to-do. Keep it simple and focus on what really matters, setting up some regular time together to enjoy each other's company and be a family. Less time pressure for kids and adults, so dinner can start later. Simple or no cook meals, like salad or sandwiches, are welcome. More relaxed bedtimes and no homework can mean more time to sit and linger after dinner, play family games or even play outside or take a walk after dinner. Unlike watermelon on the porch or catching fireflies, a summer meal tradition can be one that you can hold onto into the fall and throughout the year. What better time to enjoy family dinner! I just discovered this recipe when it was to hot to roast or even grill a chicken I had bought. Not wanting to waste it, I searched my slow cooker cookbook for ideas. The result is very much like a poached chicken. There is literally no water added, but it works! Salt and pepper whole chicken inside and out. Place in crock-pot. Add garlic cloves if desired. Cook on LOW setting for 4-6 hours depending on size. Test chicken for doneness with a thermometer. Inside the thigh reading should be at least 165 degrees. When chicken is fully cooked, remove it to a platter. The skin should be removed and discarded. (It will look pretty bland and awful). There will be a concentrated sauce that you can use to make gravy or just save for stock. Cut the chicken off the bone to be served separately or used in any recipe with cooked chicken, such as tacos or chicken salad. At our house, we used the chicken to make delicious make-you-own sandwiches with good crusty bread, fresh tomatoes and a side salad. Enjoy!